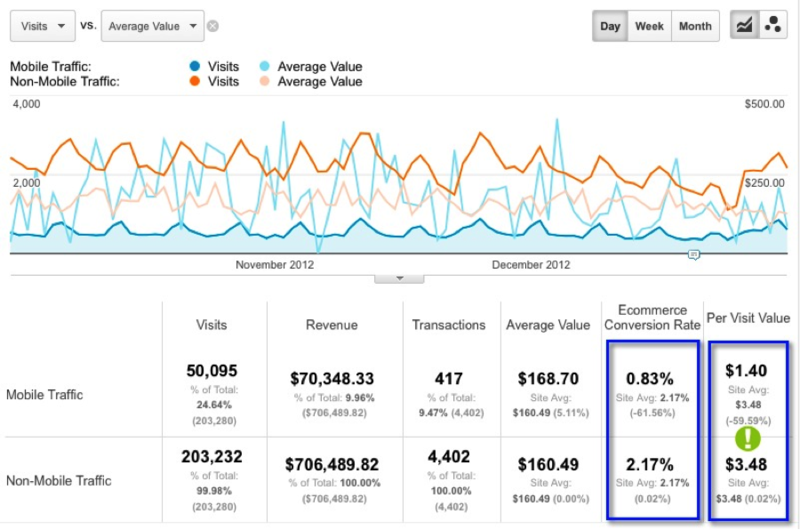 Google Analytics offers an incredible amount of insight into your website’s visitor activity. Being a free tool, it’s not as robust or in-depth as some of the paid tools like Omniture or WebTrends, but for most webmasters and marketing professionals who can’t reasonably afford the higher end solutions, it will give you plenty of information upon which to make educated business decisions. 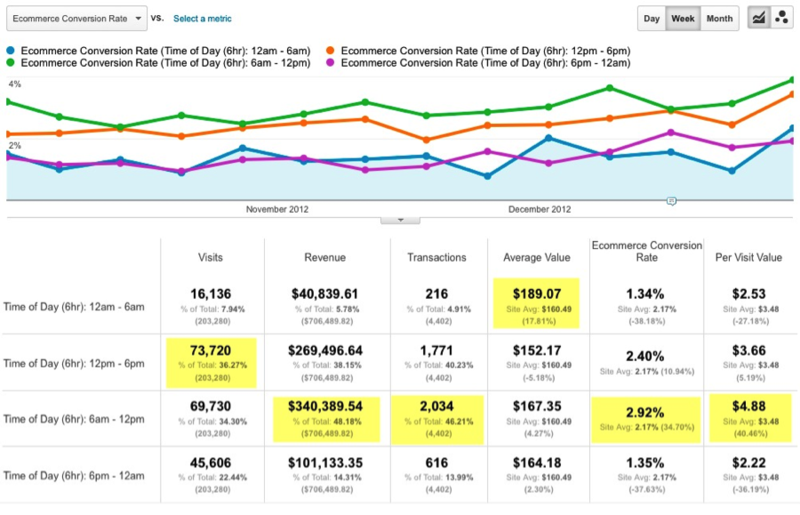 Many people who use Google Analytics don’t fully utilize all the functionality within it. Perhaps it’s because they don’t understand the features – or even know they’re there. Here are seven ways you can up your game to get even more out of this platform to increase your website’s conversion rates using Google Analytics. 1. Look at timelines using all time frames (Hourly, Day, Week, and Month) to look for trends. Do your users tend to visit during or after work hours? Do you have higher conversion rates on weekends? Are your outbound emails more successful on certain days of the week? If you have quantifiable data, you can plan out your efforts. In the example below, traffic tends to spike around 9am – this could be useful in choosing when to launch a campaign, perform site maintenance, etc., to maximize or minimize it’s impact on users. 2. Utilize Advanced Segments. Ever wanted to compare different groups of users but didn’t know how, or didn’t find the particular group within the standard set that Google provides? In the following example, mobile traffic accounts for 20% of overall traffic, but is 62% less effective in converting visitors when compared with non-mobile visitors. In the second example, visitors who visit from 6am – noon convert more often and generate more revenue than any other time period. 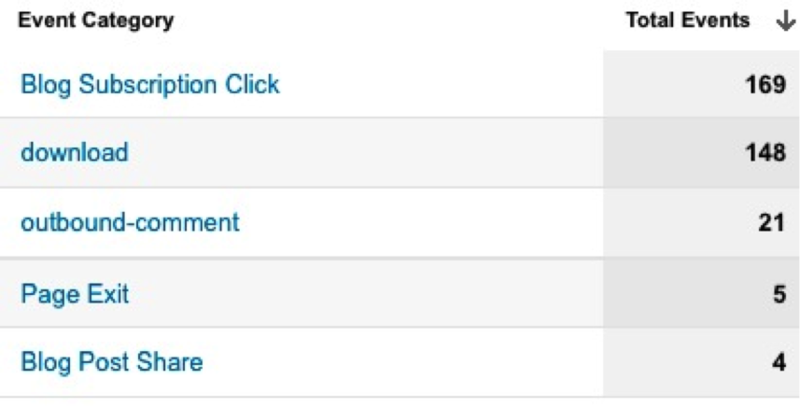 Or perhaps you want to see how Organic Search visitors compare with Paid Search visitors. It is easier to compare and contrast different groups when you can see them side-by-side. You can currently view and compare up to four advanced segments at a time. 3. Pay attention to your mobile users. Do you have a significant portion of visitors from mobile devices? If so, are they using smartphones or tablets? Do they spend much time on your site? Do they convert as well as non-mobile users? Do they abandon at a higher rate? Something as simple as just adding a mobile theme can by itself be helpful, but proactively – and regularly – addressing problem areas can incrementally improve conversion rates over time. 4. Create Intelligence Events. It’s helpful to know about significant swings in traffic, conversion rates, revenue, etc. Google builds automatic alerts, but if there are particular metrics you want to track, you can create custom alerts as well. For example, if you want to be alerted when traffic from a particular Advanced Segment (see #2) drops by more than 25%, you can set it up and be alerted by email or text message. 5. Set up Event Tracking. Ever wanted to know how many times your PDFs have been downloaded, or how many times the play button is clicked on a Flash video, or how many times people play a mobile game in a single session? Event Tracking allows you to see all kinds of interesting moments that do not end up at a thank you or confirmation page with its own URL. For example, if you know that people who download a white paper are three times more likely to convert, you can adjust your promotions and more prominently feature your white papers on your site. 6. Create – and use – custom reports. It can be frustrating to have to jump back and forth between several reports to see data that you might think would visible within a single report. That’s where custom reports come in. In this example, there is a clear correlation between users who utilize site search functionality – with a per visit value 973% higher than those who don’t. This data could lead to increasing the visibility of site search on your website, but may be missed without the insights gained by custom building reports. 7. Determine from where and why people are coming to your site in the first place. Referrals. Are you getting traffic from inbound links from other websites? Why or why not? Spend some time in the Referrals section – you may be surprised at how much traffic you are getting from a few websites. Drill down into the pages that are linking to you to see what anchor text they’re using and to what page(s) they’re linking from their site. You never know what interesting insights you may uncover. Search. If Search drives a significant portion of your traffic, keyword reports are an invaluable source of data. People searching for early stage buying information like “best digital cameras” want to see very different information than people searching for late stage buying information like “Nikon D3200 digital camera prices.” For example, if you find that most people are coming to your site on early stage keywords, but are bouncing or otherwise leaving without converting, you may want to focus on providing additional resources or better optimizing targeted landing pages for those relevant keywords. Campaigns. If you’ve been properly tagging your outbound emails, paid search efforts, etc., they will show up here, giving you a quick place to compare all campaigns against each other. Has the purchase discount link in your “thanks for signing up for our newsletter” confirmation email been successful? Has it driven more or less revenue than your paid search efforts? It’s easy to compare and contrast in this section. Note: tag your outbound email names descriptively (e.g. “12/17/12 Last Chance Christmas Free Shipping Email”) so you can quickly identify winners and losers in what may be an overwhelming list if you use a wide date range. Of course you can always speak with an online agency like Groove Commerce that specializes in SEO and optimization services to help, but every business owner or web manager should have the basic knowledge of how to view their own data. Take some time to explore these sections within Google Analytics and you will quickly notice trends and anomalies that will help you make more educated business decisions. Check out my last blog, "6 Steps to Turn Your eNewsletter into a Sales and Lead Generation Machine," to learn more about online marketing best practices.